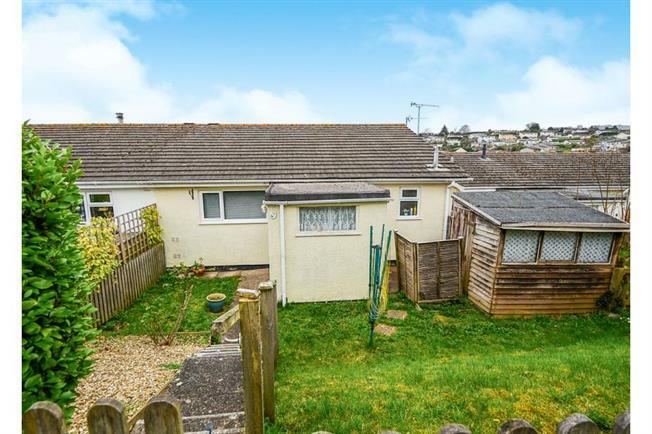 2 Bedroom Semi Detached House For Sale in Totnes for Guide Price £190,000. This property's price has dropped from £200,000 to Guide Price £190,000. This lovely two bedroom semi-detached split level house situated in the popular Bridgetown area just a short distance from Totnes town centre is a real catch. The property enjoys a spacious lounge/diner, two double bedrooms, shower room and fitted kitchen. With a low maintenance garden to the front and having no onward chain it is sure to suit your needs !! Agent Note : The Devon rule applies to this property. Part Double Glazed door to the front, stairs rising to the first floor and the lower level. Double glazed window, low level WC, part tiled walls. Fully tiled double shower enclosure with glass screen and shower over, pedestal hand basin, radiator, double glazed window. Double glazed windows to rear aspect with far reaching views, loft access, TV point, large storage cupboard, cupboard housing wall mounted gas combination boiler. Double glazed window to front aspect, range of fitted matching wall and base units, stainless steel one and half sink unit and single drainer, work tops, fitted electric oven and fitted gas hob with extractor hood over, radiator, part tiled walls, radiator, plumbed for washing machine, space for fridge/freezer, loft access. Double glazed window to rear aspect with far reaching views, built-in wardrobe with hanging space, range of fitted wardobes, radiator. Double glazed window to rear aspect with far reaching views, radiator. Fences to front and sides, lawn, part gravelled with shrubs, steps up to gated access.